Description Find the great circle from EGLL or LSZH to any point on Earth or vice versa. 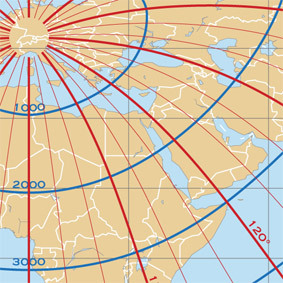 Great Circles in 10° steps (initial True Track) indicate the direct way and in addition the shortest distance from point to point. • Initial True Track and distance from Zurich to Dubai?